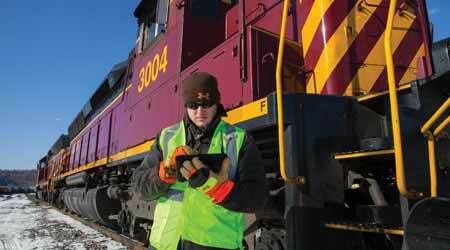 GE’s mCrew tablet-based reporting software enables crews to report train and rail-car movements from the field. Photo – Carload Express Inc. In late 2017, the American Short Line and Regional Railroad Association (ASLRRA) released a new strategic plan following months of planning and discussions. The plan features seven objectives aimed at addressing small railroads’ biggest challenges. One of the plan’s goals: educating short lines about the implications of adopting new technology. “Now is the time for ASLRRA leadership to create a road map for the future, guiding our focus, investment and value to our members,” said ASLRRA Chair Judy Petry in the winter 2018 edition of the association’s Short Line Connector magazine. Like their Class I counterparts, regionals and short lines are doing what they can to stay on top of the latest technological trends. Part of that involves learning how to leverage their growing collection of track, locomotive and equipment data. By combing through Big Data and taking advantage of automation, railroads can drive efficiencies and predict when major components might fail. But since small railroads often lack the staff, funding and other resources needed to develop and test new technologies, they’ve been using a host of “off-the-shelf” products and banding together to share insights about what works and what doesn’t. Those technologies eventually could include automated track inspection machines and other innovations. For the time being, many short lines continue deploying GE Transportation’s suite of digital products, which includes the RailConnect™ transportation management system. RailConnect is designed to help railroads use data to reduce unplanned downtime and improve velocity, productivity and fuel efficiency. GE counts 520 small railroads among its customer base — accounting for “virtually all” regionals and short lines in the United States, said Jen Schopfer, vice president of the company’s Transport Logistics division. In her view, GE’s RailConnect™ transportation management system is “the living definition of leveraging Big Data to drive outcomes.” The system processes billions of bytes to help automate and track car movements and switching operations. Deployed by several regionals and short lines, the RailConnect suite of products also can help drive efficiency in billing and other financial matters. Carload Express Inc., which operates four short lines in the eastern U.S., is a heavy user of GE’s suite of digital products, said J. Alex Lang, the company’s vice president of equipment and technology. Carload Express recently began deploying mCrew software, which is the mobile version of the RailConnect system. The tablet-based reporting software enables train crews to report train and rail-car movements from the field. Carload Express plans to equip four locomotives with Wi-Tronix LLC’s Violet software, which includes a locomotive data acquisition recording system. Before mCrew, such information was faxed between the back office and train crews in the yard. Those faxes were vulnerable to transmission errors, Lang said. Meanwhile, Carload Express soon plans to equip four locomotives with Wi-Tronix LLC’s Violet software, which includes a locomotive data acquisition recording system. The software offers users cloud-based access to real-time streaming event recorder data, which can be useful for positive train control applications, according to Wi-Tronix. The software also secures data up to the moment of a potential power loss, which can help with accident investigations where event recorder data is inaccessible. “This will be the most data we’re collecting from a locomotive,” Lang added. And when it comes to sharing data about shipments, there are opportunities to improve exchanges between short lines, Class Is and shippers. To that end, ASLRRA is working with Norfolk Southern Railway, Genesee & Wyoming Inc., Anacostia Rail Holdings and a shipper to pilot a new platform that would provide up-to-date information on loaded and unloaded cars on their networks. That latter metric is key as folks become accustomed to real-time delivery information with online retailers like Amazon. But as railroaders continue to embrace Big Data, it’s important they don’t lose focus on acquiring the “right data,” said Adam Nordstrom, principal of lobbying firm Viking Navigation LLC, which works on behalf of several rail-industry clients. He previously lobbied on ASLRRA’s behalf during his tenure at Chambers, Conlon & Hartwell LLC. “This is particularly true in relationships with large railroads, especially when the larger partner’s data systems govern when a train is handed off and when the customer is billed,” said Nordstrom in an email. To capture their share of revenue, regionals and short lines need to have visibility on that data, as well as an understanding of how it affects revenue, he added. Aside from the financial hurdles associated with rolling out new technologies, small railroads face a challenge in training workers how to use new software and tools. So, what’s the best way to overcome that obstacle? Schopfer suggests focusing on the positive outcomes of using a new tool or application. 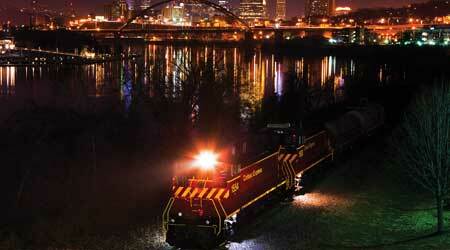 For instance, GE touts the potential of its products to increase rail utilization and decrease costs to shippers. With those benefits in mind, employees may be more willing to embrace new technologies, she believes. For several years, ASLRRA has been working to educate small railroads on the benefits of such embracement. In 2003, the association formed a committee to serve as resource about new and emerging technologies because many of its members can’t afford to invest in dedicated tech or data experts, Darr explained. “It’s important to note that we are a group that attempts to educate both railroads and vendors on the technology needs of not only the ASLRRA’s members but also those of the entire rail industry,” said Belt Railway Co. of Chicago Chief Information Officer Nick Chodorow, who chairs the committee. Each month, committee members hold conference calls to discuss the latest technological trends, he said via email. This past June, the committee organized a technology summit in Annapolis, Maryland. Held at committee member Rockwell Collins’ conference center, the event attracted short-line information technology (IT) leaders and vendors’ representatives. The summit was an opportunity for attendees to have a “thoughtful discussion not only about technology itself, but also about how technology can support the future of the rail industry,” Carload Express’ Lang said in the fall 2017 issue of ASLRRA’s Short Line Connector. “I found value in the conversation around the modern consumer’s retail experience with online ordering and how those expectations are driving how customers interact with the rail industry,” he said. Although ASLRRA’s technological bent isn’t new, short lines are still “a number of years behind” the Class Is in adopting innovations, said Allan Pickering, project manager at Bartlett and West Inc., an engineering and technology firm. Pickering serves as vice chair of the association’s technology committee. “Thorough investigation and determination of the root causes of business issues can target solutions to that problem without … excessive cost,” he said in an email. As for other future technological applications in the short line industry? Chodorow sees potential in gathering and analyzing key equipment data for predictive maintenance — that is, catching potential problems with equipment before it fails. “This would reduce employee costs [and] downtime of train operation,” he said. Tapping into geographic information systems (GIS) technology also can be beneficial for short lines, Pickering said. GIS databases can be used to record and locate every asset a railroad owns, including track, ties, turnouts and grade crossings. This enables railroads to visualize their assets in maps and schematics, and to ask questions about that data. “I like to tell people to imagine using Google Maps. In your personal life, you would ask Google Maps, ‘Where is there a Mexican restaurant near me?’ Behind the scenes, Google Maps is driven by GIS — it is a database that understands where on the surface of the Earth each of its records resides,” Pickering said. For short lines, GIS databases could help them make determinations about the best spots for infrastructure investments that take advantage of the Section 45G tax credit, which has been extended retroactively through calendar-year 2017. The credit enables regionals and short lines to claim a 50-cent tax credit for every dollar spent on track improvements. Continuing to leverage GIS and other technologies may soon become a matter of survival for small railroads, ASLRRA’s Darr believes.